Early photograph of Cyrus, Rachel, and Star Koresh ("Howell"). All three died in the Waco Holocaust. 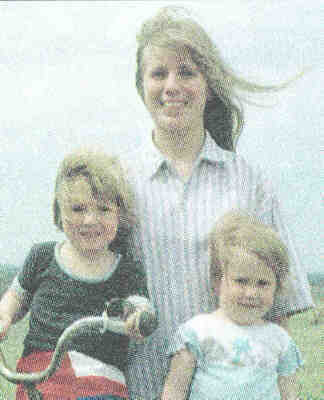 Photo in Newsweek, May 3, 1993, pg. 22. A corpse decomposes over time—the longer the time since death, the more decomposed the corpse. Because time since death questions are so important, decomposition of corpses over time is studied by forensic experts. The studies are conducted in the field and under controlled conditions. Second, as Sgt. Coffman's testimony shows, the roof was never shored up. This fact is verified again by The Dallas Morning News (Saturday, May 1, 1993 pg. 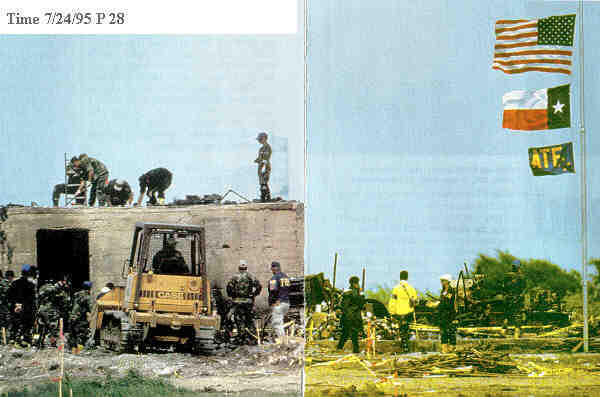 24A): "Also Friday [April 31], authorities bulldozed the concrete bunker that was the compound's last standing remnant. 'We had determined that it was structurally unsound because of a support beam in the middle of it had become detached [sic],' said DPS (Department of Public Safety) spokeswoman Lauren Chernow." Note that in this statement Dr. Peerwani does not give an estimate of time of death—he says only that the people in the concrete room died at approximately the same time. When reviewing the Autopsy Reports, you will find that remains of many who allegedly died on April 19 were severely decomposed. Internal organs were no longer recognizable. They had turned into a brown amorphous mass, or had totally liquefied; the severe decomposition was often used as a reason to terminate closer examination. Unidentified, Mt. Carmel Doe 65 is typical. Under "Internal Examination," Gary Sisler writes: "The internal organs consist of amorphous brownish decomposing mass of tissue … and precludes further examination." Perhaps the moderate decomposition of those five was surprising, but even more surprising were the differences in the rates of decomposition among the corpses found in the concrete room—all of whom we are told died on April 19 "within minutes" of each other. Julliete (Mt. Carmel Doe 54) and Crystal Martinez (Mt. Carmel Doe 57) showed only moderate decomposition, yet they were found in close proximity to other corpses that were severely decomposed—for example, their son and brother, Joseph Martinez (Mt. Carmel Doe 52). Had all the people in the concrete room died within minutes of each other, and had the bodies been subjected to the same climatic and burial conditions—which they were—the differences in the rates of decomposition should have caused Dr. Peerwani and his staff to sit up and take notice. The differences were extraordinary. There was no need to have these remains wait until the staff at the Tarrant County Medical Examiners Office could handle the load. We have already seen that three other pathologists had volunteered to help (The Dallas Morning News, April 22, 1993), and that Waco was within easy driving distance of Dallas, Houston, Austin, and San Antonio. Some of the remains could have been distributed to those centers for quick and orthodox handling. Many of the bodies found in the concrete room are both severely decomposed and dismembered or pulped. But the Autopsy Reports of at least four sets of remains present a different picture—the remains were separated due to the decomposition of the connective tissue between the joints. The Autopsy Report of baby Paiges Gent (Mt. Carmel Doe 64), reads : "Body is disarticulated mainly because of advanced postmortem decomposition …"
"The head is disarticulated with most of the facial soft tissue absent … Furthermore, there is no brain tissue present. Cervical vertebrae are disarticulated and without trauma. Hyoid bone and the larynx are absent as is the soft tissue of the neck. Chest and abdomen reveal advanced decomposition with bone structures and decomposing tissue commingled. All the ribs are identified and are partially articulated from the thoracic vertebrae. Chest and abdominal and pelvic organs are severely decomposed and reduced to mushy pasty foul smelling partially liquefied tissue. Individual organs are not recognized. Upper extremities are disarticulated with soft tissue markedly decomposed." According to Dr. Michael M. Baden, there is a reliable way for determining the time of death—the potassium eye fluid test. [p. 144] ... Mr. Thibodeau indicates all "those autopsies" were suspect. He indicates the bodies were stored in a faulty cooler at the medical examiner's office and partially decomposed prior to the autopsy. With regard to the faulty cooler, the OSC has advised me that [p. 145] any refrigeration defect in the storage of the bodies was for a short period of time and occurred after the autopsies were already completed. 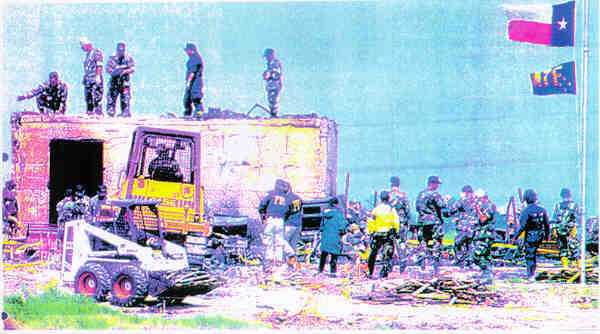 The Texas Ranger on site at the scene of recovery in the concrete room just after the fire on April 19, 1993 complained about the stench from the bodies. 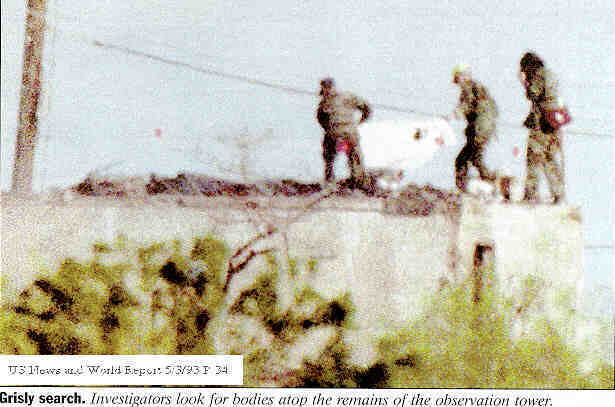 The last body buried in the spent cartridges in the concrete room was recovered on April 29, 1993; with two exceptions (MC Doe 33 on May 29, 1993, and MC Doe 64 on September 9, 1993), the last body was autopsied on May 11. There is no indication of a refrigeration problem in any of the Autopsy Reports. The corpses themselves will be of little use. Weeks after they were autopsied, the morgue's refrigeration failed. The bodies liquefied. 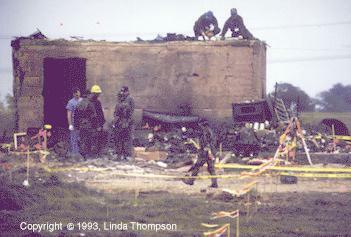 The evidence shows that many of the Davidians were dead long before April 19, 1993, the day of the fire.